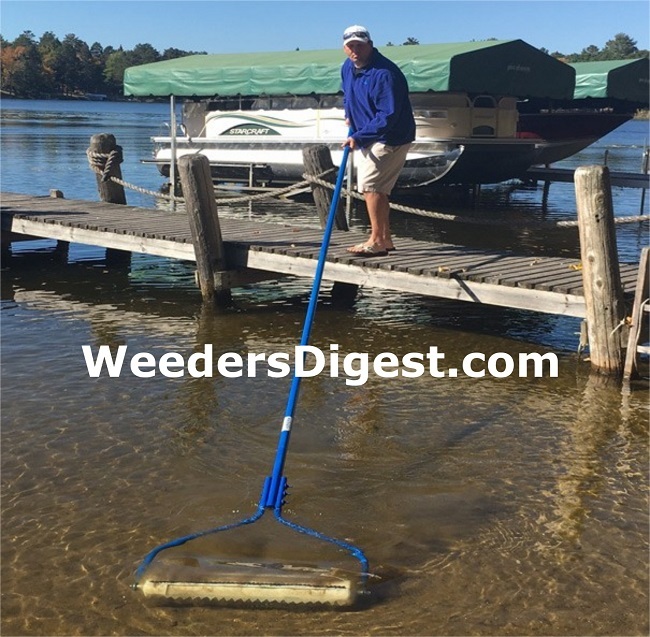 The Beach Roller from Weeders Digest uses the same concept as our Lake Groomer except it is a hand held tool and much smaller. It works great for maintaining a weed and muck free beach. It is used by rolling it back and forth along the lake bottom as it agitates the weeds and muck. This will cut and pull any rooted seaweed and aquatic vegetation. Removing the entire plant is important because weeds will not grow back because they are truly gone. The Beach Roller will also work to stop weeds from taking root along with stirring up sediment from the bottom of your beach which is beneficial to getting rid of muck. The weeds will then either blow away to a location other than your lake shore, OR you can use one of our lake weed rakes to collect all of the removed weeds. Watch the video of the Beach Roller to see it in action! If you are interested in a more automated solution dont forget to chck out our Lake Groomer. If you are trying to get rid of lake muck, then you have to see our Aqua Thruster. Let the roller fill with water and sink to the lake botttom. The rollers 6 ripping blades cut and pull up weeds and muck. Cleans a 2 foot wide path. Cuts AND pulls weeds out by the root. Loosen and removes the mud on the bottom. Gets down to the hard bottom, so you can use your beach. Keeps the sandy bottom clean. Removes undesirable weeds and muck from lake bottom. Inexpensive. 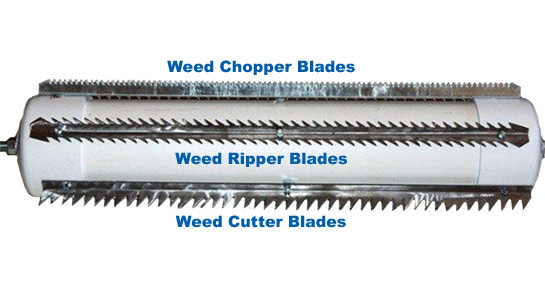 Does not cost $1000's like other weed tools. Portable - use in all areas and depths other tools miss. No expensive - harmful chemicals are used. Easy to move or store when not in use. Made locally in the U.S.A.
What an a great find. So much better then pulling all those nasty weeds. Wish I would hav discovered this much sooner, then I would not have put my back out of place. Thank you Beach Roller for peace of mind. Super easy to out together and use. I use it daily and after just one time I can see the difference. Was easy to assemble, easy to use, fast shipping. The customer service received was tremendous. We were very impressed with the results after two days of use. Highly recommend. We had been using a landscape rake to keep the weeds down but it was a losing battle. The first pass with the Beach Roller took me 3 days to do my 120' of bulkhead and all around my 2 docks. I had to clean the roller every other time I pushed it out, but after that it got to be a lot less work. After using once daily I had no weeds and a sandy bottom after ten days. I've been using it once every 2 or 3 days now and after 4 weeks I have a hard packed sandy bottom. The Beach Roller got rid of the weeds and the muck and without the use of chemicals. I do reccomend it for those in good shape or those wanting to get that way. I wish a hard cover was offered for it as it has very sharp teeth. Bottom line is it works and I feel it was money well spent. I learned about this product from my neighbor who had been to a boat show. I went online and found it at Weeders Digest. The Beachroller arrived quickly and was easy to assemble (except for one hole in the pvc that wasn't completely open - I carved it out with an exacto blade). It took about 20 minutes. A friend gave me a tip to put all the bolts in the handle going in the same direction, to avoid his mistake. The direction sheet could be better; it has very small print & the photos are not not clear against the yellow background. The Beachroller performed well, pulling in unbelievable amounts of thick dense weeds carpeting the bottom. I wore rubberized gardening gloves to remove the mat of weeds from the roller. I used this in combination with a lake rake to collect weeds that floated on the surface. After letting the weeds dry out some on the shore, I hauled them to the compost pile. To keep your lake in decent condition & be a good neighbor, don't put them back in a deeper part of the lake or on to your neighbor's. Now that the big mass of weeds is out it should be pretty easy to maintain the lake bottom. P.S. I am an almost-70 year old woman and had no problem assembling and operating it.